THE STORY - Starr Carter is constantly switching between two worlds -- the poor, mostly black neighborhood where she lives and the wealthy, mostly white prep school that she attends. The uneasy balance between these worlds is soon shattered when she witnesses the fatal shooting of her childhood best friend at the hands of a police officer. Facing pressure from all sides of the community, Starr must find her voice and decide to stand up for what's right. ​​If you had told me that a film based on a YA novel from the producers of the “Twilight” series and the director of “The Longest Ride” would be one of the most vital, compelling dramas of the year, I would have laughed in your face. And yet...here we are. 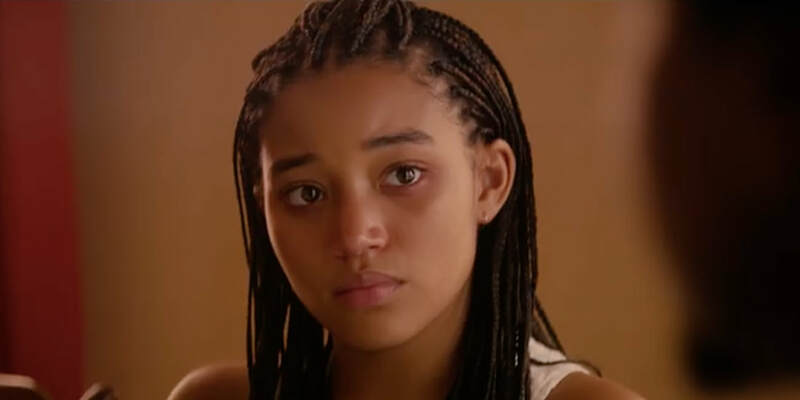 "The Hate U Give" is a riveting, heartbreaking coming of age story, supported by a towering, star-making performance by Amandla Stenberg. Starr (Stenberg) lives in a poor Mississippi neighborhood, raised by her caring parents Lisa (Regina Hall) and Maverick (Russell Hornsby). She and her brothers commute to a wealthy private school, where Starr finds herself masking her identity, listening to Taylor Swift and indie rock, and altering her speech patterns to blend in. When her childhood friend (“Detroit's” magnetic Algee Smith) is killed by a police officer while unarmed, Starr is the only witness. As tension builds in the town in the aftermath of the shooting, Starr's carefully kept barriers between her two selves begin to crumble, forcing her to discover exactly who she is and what kind of activist she will become. One part tragedy exploration, one part coming-of-age film. If the film sounds big, even epic, that's because it is. Clocking in at two hours and fifteen minutes, the film is a long emotional journey, bursting at the seams with assorted characters and plot threads. Not only is Starr struggling with the implications of being the sole witness to a murder, she is also balancing high school issues like a boyfriend ("Riverdale’s" KJ Apa), prom, as well as the constant threat of her neighborhood’s drug dealer, King (Anthony Mackie). And yes, sometimes it’s all a little too much. There are undeniably a few too many characters. For example, a recurring Police Officer character played by Common is present essentially just to remind the audience that not all cops are bad. And sometimes, the narrative’s desire to present comic relief scenes undercuts the drama (This occurs well into the third act). The film also occasionally falls into the YA trope of utilizing voiceover too extensively. Some of this provides some seriously on-the-nose observations that essentially spell out the film’s themes for you. And ultimately, the film, in true mainstream studio drama fashion, wraps all of its many plot threads and themes up a bit too neatly. But those are minor quibbles in comparison to the raw power the majority of the film has going for it. The entire ensemble is flawless. Stenberg especially, is absolutely devastating, utilizing her innate charm to its maximum potential at the film’s beginning and slowly eroding herself down to strands of pure live-wire emotion by the ending. Her eyes and voice say so much. You can’t bring yourself to look away, and you genuinely believe every step of her journey. Meanwhile, Russell Hornsby is a giant, portraying one of the best cinematic father figures in recent memory. He creates a rich, fully fleshed out character that transforms from menacing to nurturing to comic relief and back again at the drop of a hat. Cinematographer Mihai Malaimare Jr. ("The Master") effectively communicates the differences between Starr’s two worlds: her neighborhood is swathed in shades of warm yellows while her school life is drenched in cold shades of blue. And he captures the film’s climactic riots with a real sense of chaos and urgency. Composer Dustin O’Halloran ("Lion") lends the film touching orchestral chords that contrast nicely with the film’s rap tracks (including the Tupac song from which the film derives its name). And finally, we have to credit director George Tillman Jr. and writer Audrey Wells for making this long journey compelling. Even with the film’s many threads, the two keep the overarching narrative moving smoothly. There's so much to praise with "The Hate U Give." The supporting characters are uncharacteristically well-fleshed out for a YA film, the plot points are sometimes unpredictable and largely devoid of clichés. The film wants to be so much more than just a ‘message movie’. It wants to be a true coming of age film about identity. And amazingly, partially because it is so long, it is able to be all three. You care about the characters. You feel their peril and their pain. And that is why the film is so effective. Each character is so much more than just a vessel for their beliefs. It is about so much more than just “a police shooting.” Tillman Jr. and Wells make broad swings and somehow hit a home run. They do the unthinkable. They actually manage to have their cake and eat it too. The adaptation has worked so effectively that this film could (and likely will) pass as an entirely non-YA project. It is the kind of bold yet accessible kind of mid-budget studio filmmaking that we need more of. Is it flawed? Sure. Could it have been more pointed in its arguments? Perhaps. But that same accessibility will be more likely to make viewers examine their own beliefs. As such, its many strengths more than overcome those flaws.